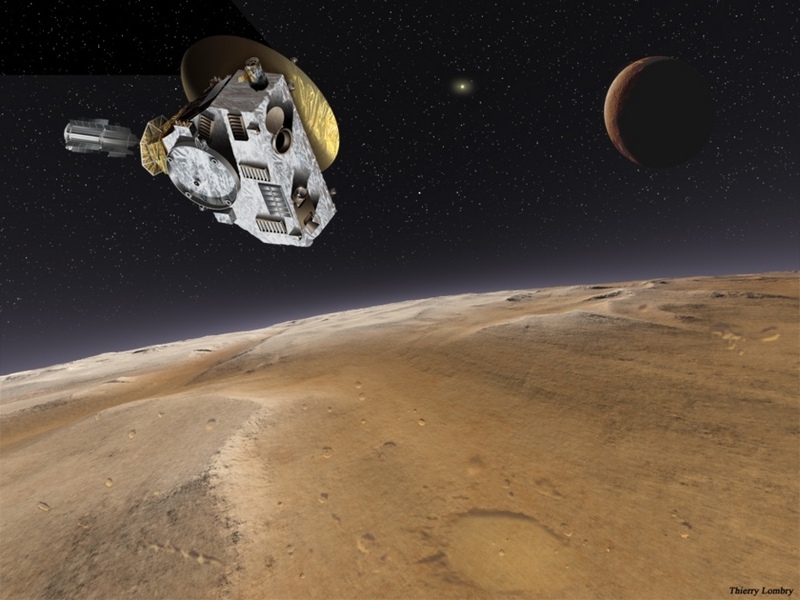 (Bellingham, WA)— The Spark Museum will host a free event on Tuesday, July 14th, to celebrate NASA’s New Horizons spacecraft during its historic, closest-ever approach to the dwarf-planet Pluto. The event, Pluto Revealed, will highlight the exciting moment when NASA expects to receive confirmation that the New Horizons spacecraft survived its close-encounter with Pluto. This signal is expected at 6:02pm and will be the first communication from the spacecraft after 24 hours of time dedicated solely to science observations. The event will provide a video stream into NASA’s Mission Control for this period. 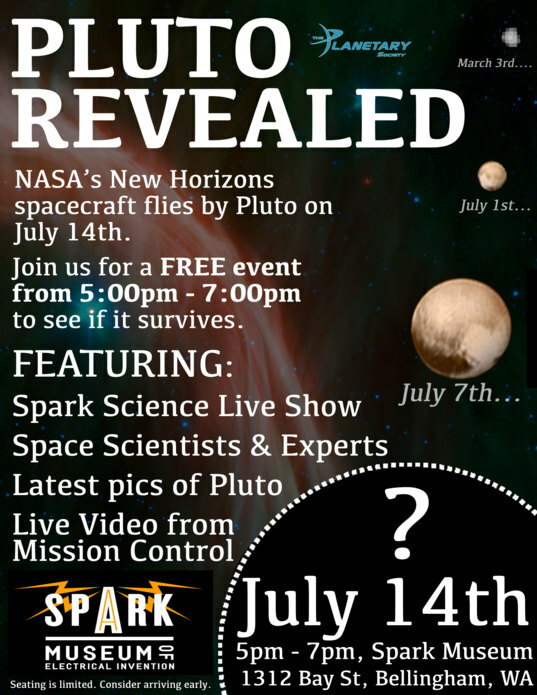 Pluto Revealed, runs from 5:00pm to 7:00pm on Tuesday, July 14th, and features a live taping of the podcast and KMRE 102.3 radio show, Spark Science. The show will feature special guests Dr. Melissa Rice, a planetary scientist from Western Washington University, and Casey Dreier, Advocacy Director for The Planetary Society, the world’s largest nonprofit space organization. The event will also feature multimedia presentations and displays about the New Horizons mission, the historical background of NASA’s previous attempts to explore Pluto, and provide frequent opportunities for audience interaction and Q&A. Pluto Revealed will also present the latest and greatest images of the surface of Pluto before the close encounter period, and provide expert scientific analysis with the audience. After a nine-year interplanetary voyage, New Horizons will be the first spacecraft in human history to provide a close-up view of the solar system’s largest dwarf planet. The Spark Museum invites the public to join the celebration by attending this free, family-friendly event to celebrate this historic moment of humanity’s first reconnaissance of Pluto. WHY: To celebrate the historic first encounter of Pluto by NASA’s New Horizons spacecraft, and to watch the critical reacquisition of signal after nearly a day of radio silence. Note: This event is not sponsored by The Planetary Society. The Society has no control over, or responsibility for, the content or operation of events sponsored by other organizations. All inquires should be directed to Casey Dreier. The Spark Museum will host a free event on Tuesday, July 14th, to celebrate NASA’s New Horizons spacecraft during its historic, closest-ever approach to the dwarf-planet Pluto.